Pattern Free ! 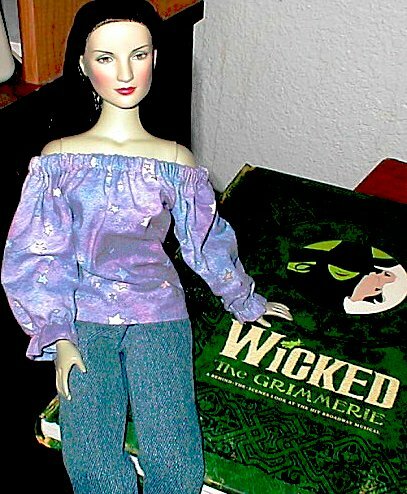 A Peasant Blouse for ANY Doll ! No pattern ! Will fit any doll ! Wanna make this ? Keep on reading ! The Pull-On Elastic Top Peasant Blouse ! Ready for another project ? This one is sort of like the sock blouse for Tyler and Barbie size dolls, only it's for any size doll, and we're gonna be using a cotton or cotton blend. In other words, a fabric that *doesn't* stretch ! 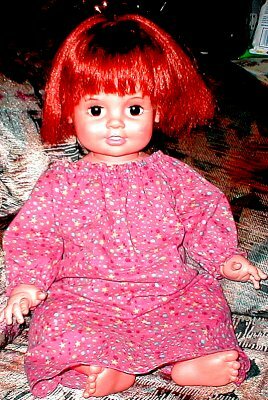 First, go grab your doll and a tape measure. You're gonna need four measurements - around her shoulders, around her waist and arms, the length of her arms, and her hand diameter. You may wanna go ahead and measure her waist without her arms, too - just to verify in a few minutes. Please say 'Hi !' to today's model ! Playmates' "Before Once Upon A Time" Ariel has long needed something new, and she's willing to stand still for a long time. Isn't she a sweetie ? In Photo #1, her shoulders measure about 10.5" around. In Photo #2, her waist including her arms is 14" around. In Photo #3, her arm length, starting from where I measured her shoulders earlier, is about 4", including her slightly bent elbow. In Photo #4, the widest part of her hand is about 3 and 3/4" around. You may also want to measure her upper arm, just in case. I have two dolls that have larger upper arms (where the arm meets the torso) than splayed hands - you'd think the hand and outstretched fingers would be larger ! Use the larger of these two measurements if they're different. Also measure her from shoulder to 'armpit'. This'll determine how far down from the top the sleeve stitching will go. This is how we're gonna figure how much fabric to cut. First, we double her shoulder measurement. 10.5 x 2 = 21 inches long. fabric to go over her waist ? 21" - 8" = 13". Her waist is 9.5 inches, so that should be enough. So far, we need a piece of fabric 21 inches long. Her arms measure at 4 inches long, but we need to add a half-inch bottom hem and a half-inch top casing. So the fabric needs to be five inches wide (4" + .5" + .5" = 5"). 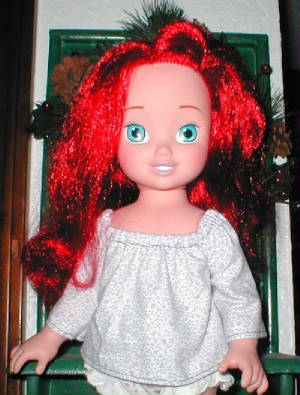 Of course, this is just an example - but it shows how to do this for your beloved doll ! Cut fabric according to what you've determined you need. In my case, I need a strip 21 inches long and 5 inches wide. Measure out a half inch hem at the bottom all the way across, pin and sew. Do the same thing to the top, to make the casing for your elastic. Elastic time ! I have tons of 1/4" wide elastic, so that's what I'm using here. If you'd like to use wider stuff, adjust your measurements accordingly. waist and arms and head easily, before I cut it. 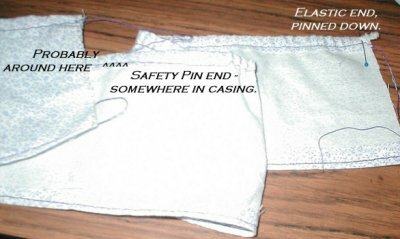 Attach a safety pin to one end of the elastic and thread it through the casing. When the other end reaches the start of the casing, pin it down, and thread through to the other side. Take off the safety pin, and pin this end down, too. Arrange the gathers evenly. 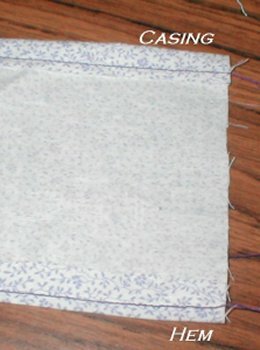 If you like, you can hand-tack the elastic down, or you can fold your strip right sides together, lining up the casing and hem. Make sure the elastic is flat within the casing. Sometimes it can twist during the feed-through. 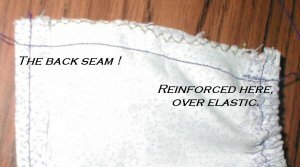 Sew the back seam all the way up, from the hem to the elastic. You may want to reinforce the elastic with a few extra stitches. We're nearly done ! Now then, tie off the thread ends of the back seam and cut. Time to do sleeves ! Leave it wrong side out, but this time, center the back seam at the back and lay it down flat. Time to mark sleeves. Since Ariel's hand is nearly four inches in diameter, we're gonna mark two inches in from the sides, and about an inch down from the top. Sew. I like to use a narrow 'U' shape, but you're welcome to square it off or use whatever shape makes you most comfortable. Just make sure you've got good measurements and stay within 'em. I stitch right on the line I just drew, then make a couple stitches over and come down. You're gonna cut between these stitch rows, so don't make them too close together, or you'll have to resew because the thread didn't have enough fabric to 'grip'. So far, I've found that, no matter what material I used, about a half an inch between the two lines is good...about the width of the zig-zag presser foot normally in my sewing machine ! I like to use a contrasting thread for this, since it makes it easier to see where you're gonna cut soon - and it's in the inside and won't show anyway. Tie off your thread ends, and grab the scissors. Carefully cut the sleeves from the bodice. All right ! Turn it right side out and give it a try. If all the measurements are right, it should fit great ! And that's one easy peasant blouse ! If it's snug on the waist, you may want to pick a few stitches and turn the fabric in to make cool side slits. 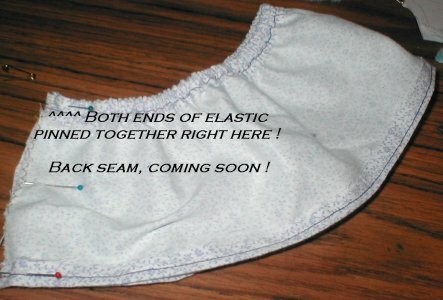 Or you may want to tighten the elastic a bit - easy to do, you just have to pick a few stitches from the back seam where the ends are, stretch and snip, then resew. Next time, you may want to pick a few stitches at the sleeve seams and slide elastic into the cuffs. You can use more fabric for fuller sleeves, or a bit less for a more snug fit, and have lots of fun decorating them ! 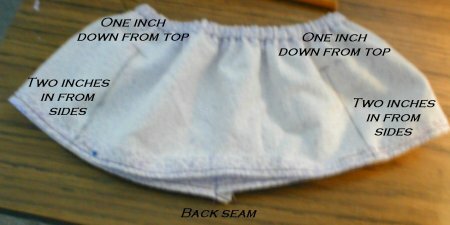 Using the same idea, you can make a jacket by folding the ends in and hemming instead of sewing them as the back seam. Add closures to the hem, and instant jacket ! You can shorten the sleeves, make the bodice part longer to make a dress or nightie. 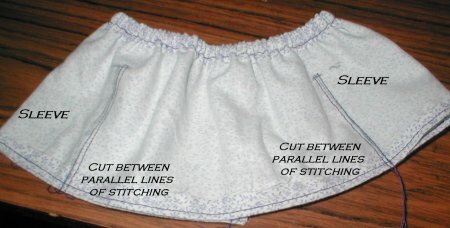 You could even try shorts or pants using the same elastic-top tube, by measuring the waist and hips, leg length and rise (distance from waist to center crotch), and sew in legs like you sewed in sleeves. The possibilities are endless - especially for those dolls that had no patterns made for them, or for those hard-to-fit ones. If something isn't clear or you have questions, feel free to contact me at dollsewist@hotmail.com. I made a matching skirt and belt ! Just for fun, I made a simple skirt to match. It's about the same as the blouse - twice the waist measurement, elastic to fit waist and stretch over the hips. Hem and casing, string elastic through, back seam, done. It really needed more, so I made a ribbon belt - basically a length of ribbon hemmed at the ends with Velcro added. 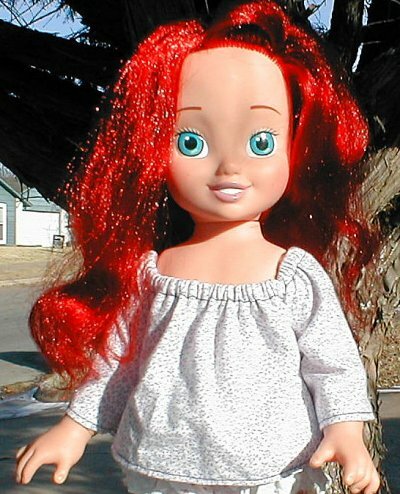 Now Ariel has a pretty dress ! Casey's ready for a Christmas party ! And so is Gracie ! 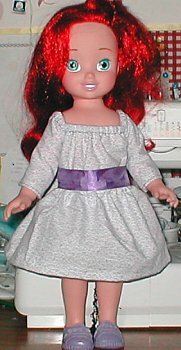 With a blouse this easy to make, lots of dolls can get new clothes fast ! Each blouse took about an hour, but I bet a kid could wear them easily. If you haven't yet met 'Casey' and 'Gracie', they're My Size Barbies, customized by Beloved Hubby and me. They're also featured on their own page - feel free to give them a visit ! I wanted a full blouse for redhead Casey's busy Christmas candy print, so I used 2 1/2 times her shoulder measurement. Sleeves were a bit long, so I had to re-hem them, not a problem. Her slacks are from Doll Shop Deluxe, a doll pattern program also reviewed elsewhere on this site. Belt is a simple ribbon, and all stands are Hubby-made. Brunette Gracie goes for a sort of neo-gypsy (Stevie Nicks ?) 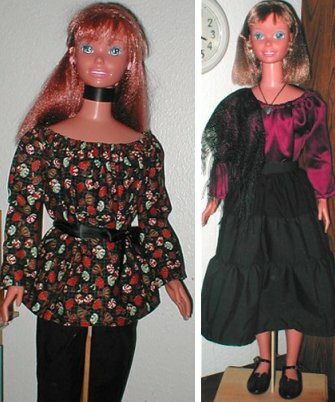 look in her satin peasant blouse, teamed with a tiered skirt from Doll Shop Deluxe and a lace shawl from Dollar Tree. Her blouse uses about ten inches less fabric than Casey's, as I wasn't sure how the thicker fabric would drape, and didn't want too much bulk. Her blouse is also a bit shorter, as I wanted to tuck it in. Same construction, similar measurements, about the same blouse, but two entirely different looks ! Amazing how much of a difference fabric drape and weight make. I wonder who'll get a peasant blouse next ? It's Beautiful Crissy in a peasant dress ! If there was a mass-market doll created to wear peasant clothes, it's vintage 70s Crissy. Her first-year issue dress is actually quite similar to this, but hers was orange lace over a darker orange cotton fabric, and was about two inches shorter. This was made much the same way as all the others, but the bottom hems were sewn separately, so they'd lie flat together. It's sheer luck that they match so well, and look like a single hem. To be honest, I was kind of hoping the lace would extend past the striped fabric hem, but it's not bad at all the way it is ! Her sleeves were cut and hand-hemmed after the rest of the dress was sewn. You can see the parts I cut off - they're a hair bow and purse in her left hand ! I like to use *all* the buffalo. The lace helps to tone down some truly bright fabric. Both pieces were remnants, one from W-M, the other from a yard sale grab-bag. I was very lucky there was enough lace to use ! before Elphie got hers ! I try to do a little something different with each one. Tunics, bell sleeves, layers...now elastic ruffled wrists ! This was a real PITA, but it looks quite good on her ! Ended up sewing to the top and across, then leaving the entire sleeve seam open, then sewing stretched elastic in, and then sewing the sleeve seam. Ended up doing those seams several times, because the sleeves were too puffy. Yes, believe it or not, they used to be *bigger* ! You can even make it quite elegant ! Sorry this photo isn't the greatest ! It's another peasant dress, this time using black peachskin fabric (from a wrecked pair of pants MIL gave me, knowing I'd reuse it eventually !). This time, a slinky evening gown gets added appeal from a top ruffle above the elastic. To get it, ya just add a line of stitching above the casing line, tall enough for the elastic. In essence, the elastic goes between the two lines. When the elastic is drawn tight, it ruffles becomingly. Like with the Beautiful Crissy dress, I had to cut and hem sleeves by hand. And I used the sleeve cutaway as the belt (Velcro closure in the back) and her neck accent. One more buffalo not goin' to waste ! The gold swirl around her is a stand - but if I wanted to embroider this, it would look quite elegant ! ...there's a hard-to-see new photo ! Here's the latest - a sweet little nightgown for my Baby Chrissy ! She's really a Baby Crissy, but I like to add the 'h' for sentimental reasons ! This fabric was purchased eons ago, back when I looked for small prints over quality textiles. So I only paid a buck for it, but it's still crap fabric. At least it makes a cute nightgown for Baby ! The collar and cuffs are ruffled above the elastic casings, like the Barbie dress neckline above. It's about as hard to see in both photos ! The cutaway sleeves for Chrissy's nightie will probably make booties for her, but I'll have to get to that later. Which leaves only Timey Tell/Hi Dottie to sew for. Tomorrow's gonna be pretty ambitious, so wish me luck ! The very last peasant - garment ! Aaand here she is, wearing the very last of the peasant garments - Timey Tell's got a new romper ! If you're unfamiliar with this style, it was quite popular amongst smaller kids when I was one. It's all one piece, and this one has no closures - like all the rest on this page, it simply pulls on. It's a lot like the peasant dresses, I just added a set of leg seams. Since I wasn't quite sure how this would work, I ended up picking apart a lot of seams to insert elastic in the casings I'd sewn, but even so, the whole thing took less than two hours. The collar, cuffs, and legs all have ruffles above elastic casings, although it's a bit hard to see in the photo ! I had to make large sleeves to get around Timey's non-removeable watch, but I'd forgotten how big her knees are, so there's not much ruffle there. Next time, I'll add 2.5 times her shoulder measurement, instead of just twice the measurement ! For Timey and Dottie, you have to make sure the finished item covers up the speaker holes in their chests, too. On the whole, though, I'm happy with it. And, of course, the bow in her hair was the cutaway pieces. For some reason, I really get a kick out of doing that !